The CD134 antigen is a 35 kDa, type-1 transmembrane glycoprotein member of the tumor necrosis factor superfamily (TNFRSF) and is allocated number 4. This antigen was originally named OX40 from the first antibody that led to the discovery of this antigen on activated rat CD4+ T cells. 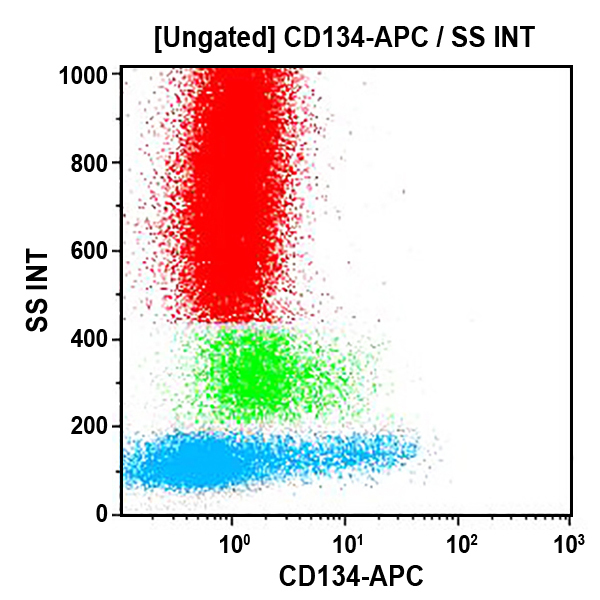 In humans, CD134 is expressed at high levels on activated CD4+ T cells and virally stimulated CD4+ T cells. Its ligand, known as gp34, is a type-2 transmembrane glycoprotein member of the tumor necrosis factor (TNF) superfamily, expressed on activated T and B cells, dendritic cells and macrophages. The CD134 antigen, through its interaction with adaptor proteins TRAF2, TRAF3 and TRAF5, is a costimulatory signal transducer of T-cell receptor-mediated activation that has been shown to activate NF-κB, a signaling factor involved in transcription of survival genes. Thus, CD134 engagement with its ligand induces clonal expansion and survival of CD4+ cells during primary responses, and results in the accumulation of increasing numbers of memory cells with time. Finally, CD134 has been shown to be involved in the T cell adhesion to endothelium.